« *** OPPORTUNITY *** K’NEX Building Toys Offers Flexible Positions with Unlimited Earnings! I've lived in Texas all my life and if there's one thing I know, it's that staying cool in the summertime is a full-time job. The heat here can be blistering and at night, the temperatures can still linger in the 80's. Scientists have proven that we sleep much better and more soundly when our room is kept cool at night. But some nights, even though our bedroom is cool, I still wake up with my back or side all sweaty and realize that the spot on the bed where I was sleeping, is steaming hot. Waking up frequently during the night completely kills the restful state of sleep and you never do re-cooperate from the previous day properly. Select Comfort is dedicated to creating the best sleep environment possible for you and they have invented a mattress pad which is supposed to regulate your body temperature through the night and help keep you cool. 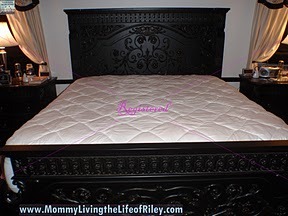 Please read on to find out how the In-Balance Mattress Pad worked for me! I reviewed the In-Balance Mattress Pad in size King from Select Comfort, which retails for $299.99. Select Comfort is having a BIG SALE on these In-Balance Mattress Pads! If you hurry and purchase one before August 1st, you can save at least $40 and even more.The In-Balance Mattress Pads normally retail for $199.99 - $299.99 (Twin XL - King), but now you can buy them for $159.99 - $239.99 (Twin XL - King)! Getting a good night's sleep is essential for anyone and especially for those of us moms who are operating on too little sleep anyway! I was so excited to try out the new In-Balance Mattress Pad from Select Comfortbecause I frequently (3-4 nights per week) wake during the night to find myself hot and sweaty. I then have to try and scoot around on the bed until I find another cool spot so that I can return to sleep. The problem is, now I have to start all over with trying to get back to sleep and I end up losing valuable time as well as feeling rather uncomfortable. Sometimes it doesn't seem to matter how cool we keep our room, I will still wake up in a "hot spot". I think this is because there is no cool air getting between my back and the bed. The room might be cool, but that space on the bed is not and this is what ends up making me sweaty during the night. The day that the In-Balance Mattress Pad arrived, I immediately put it on our bed. The first thing I noticed when taking it out of the packaging, was how plush, thick and quilted the top of the mattress pad was...and no wonder! This mattress pad top is comprised of 300-thread-count, 100% long-staple Egyptian cotton! It also felt really cool against my hand. Apparently, this was the Outlast Temperature Balancing Material at work! Next, I noticed the very elastic bottom of the In-Balance Mattress Pad. As you can see in the fourth picture above, this very stretchy Spandex skirt resembled thick pantyhose and fit easily over our rather plump mattress. Normally, we have trouble with other bedding fitting properly on this mattress, but the In-Balance Mattress Pad fit like a glove with room to spare. I was also happy to learn that the polyester fiberfill used in the mattress pad's top contains an antimicrobial agent which will inhibit the growth of fungus, mold, mildew and the odors they cause. 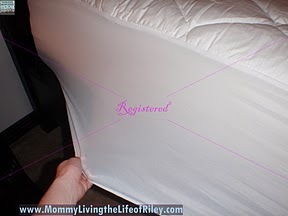 This is wonderful for my husband has allergies and when there's only a sheet separating you from the top of this mattress pad, it is very easy for your mattress pad to start growing things it shouldn't! YUCK! Now, that it was on and looking great, it was time to get some zzzz's! I have to report that I have been sleeping on the In-Balance Mattress Pad for over a month and during an extremely hot summer here in Texas. Before, I was waking up 3-4 times per week at least once a night feeling hot and uncomfortable. 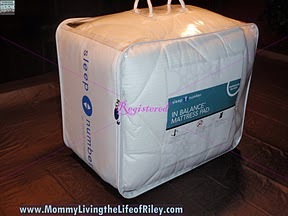 Since using the In-Balance Mattress Pad, I've woke up that way TWICE...in a MONTH! Definitely an improvement, huh? The thing I really like about the Outlast Temperature Balancing Material used in this mattress pad is that it feels super cool to the skin when you first get into bed. Everyone loves the feeling of nice, cool sheets and that's the feeling you get with the In-Balance Mattress Pad. Don't get me wrong though. You won't keep that cool feeling all night. As a matter of fact, there were times that I wasn't even sure it was working because I was expecting to feel COOL at night. But, that's not really how you feel. You just feel comfortable and you stay that way. When you look back and remember the night before, you'll realize that you didn't wake up hot. That's how I knew the In-Balance Mattress Pad was doing its job! Select Comfort is definitely on to something great when they created the Outlast Temperature Balancing Material used in many of their bedding products. Disclosure: I received the In-Balance Mattress Pad in size King from Select Comfort in order to facilitate my review. No other compensation was received. This product review is based on my own personal experiences with this item and is completely honest and objective.